Redshift is an impressive and lasting record because it manages something not all experimental music can pull off. It is both immediate and challenging, catchy and complex. Redshift is Rhyton's fifth studio album, and third for Thrill Jockey, which might be a bit surprising. The trio's output, while applauded, has also been overshadowed by some of the players' other work. Dave Shuford was in No-Neck Blues Band and fronts D. Charles Speer and the Helix. Rob Smith plays in the excellent psych-rock outfit Pigeons. Jimy SeiTang, meanwhile, played in Psychic Ills and has his own project under the Stygian Stride moniker. The point is, these guys have already put out plenty of celebrated and complex music. But as experimental trio Rhyton, Shuford, Smith, and SeiTang are on a roll. The band was strong out of the gate, with the heady, expansive rock epics of their first, eponymous record. But as the band has grown, Rhyton has also become unpredictable. The trio's last record for Thrill Jockey, Kykeon, was full of fascinating improvisations melding Middle Eastern and European traditions with rock music. Last year's Navigation by Starlight, released on the MIE label, featured two side-length pieces that broke down and rebuilt rock tropes and redefined the notion of what a power trio could be. 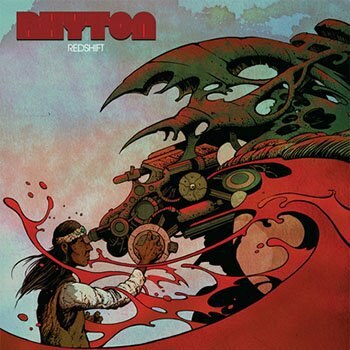 Fast on the heels of that record comes Redshift, another impressive feat for Rhyton. It certainly connects with all the previous records and yet, like those albums, it sounds distinct from anything else the band has done. It's an album about upending expectations, about giving you one thing and swapping it out for the other. The title track sounds like straight-on barroom country at the start, something closer to D. Charles Speer than Pigeons, and features a rare vocal turn for Rhyton from Shuford himself. But as the song choogles along, pulling you into its catchy, dust-covered stomp, the song bottoms out into dissonance, into a series of pulsing electronics, ebbs and flows of sound that could be broadcast out into the ether to wait on some otherworldly response. The two parts seem wholly disconnected, in one way, and perfectly linked in another, the physicality of the country-rock giving way to atmospheric feeling, to the ringing in your ears and the twitching in your limbs only great music can leave you with. If "Redshift" has the starkest shift on the record, it's not the only one with such a strong impact. "D.D. Damage" is on one level a blast of immediately striking, even catchy, psychedelic rock. But the more you delve into it, the more strange and sinister it sounds. The tunings throw everything off, making the inviting seem all of a sudden dark. The odd tangled guitar string upsets the mix. Smith's drums and SeiTang's bass don't work like you'd expect a rhythm section to, either, often breaking up the beat and standing counterpoint to one another. It makes for a complex listen, but the more you dig into the song's odd edges, the bigger its impact. "The Nine" builds on Greek sounds -- Shuford plays traditional Greek strings on the record when he's not on guitar -- but whips them up into a hazy brand of funk-rock. Late in the record, the band takes on Joe Walsh's "Turn to Stone". The classic rock tune fits perfectly when the band plays it straight, spending half the tune on a faithful rendition of the original. But that tribute turns to deconstruction. The players fracture apart. Shuford breaks the song's riffs down into spacious phrasings. SeiTang doesn't play bass lines so much as plays clusters of low, rumbling notes. Smith peels the beat back and carves holes in it, leaving out the snap of snare here, adding a faint roll there. In all of these tracks, and throughout Redshift, Rhyton moves from familiar to alien, from structured to free-form. This may be the album where those divisions are most clearly defined, where previous albums melded the formed with the improvised more discretely. But the effect here is as fresh as any of those records. Redshift is an impressive and lasting experimental rock record because it manages something not all experimental music can pull off. It is both immediate and challenging, catchy and complex. As fascinating as the trio is when it drifts off into unfamiliar sonic spaces, it's also just as impressive when it delivers some sweet, stomping, rock riffs. This album pits the song against the sound again and again, but whiles the textures shift, Rhyton seems to be making a subtler, larger argument with these songs. That, structured or improvised, tight or expansive, it's not about experimenting for experiment's sake. It's about chasing down a feeling, while also admitting how hard it is to define that feeling.